I really thought we'd struggle to eat two entire heads of cauliflower but (!! spoiler alert ahead !!) after two nights they are almost gone. That just goes to show you that anything is possible if you put your mind (and belly) to it. Jen is winding down her 27th week of pregnancy and the babies are the size of two heads of organic cauliflower. The organic really matters. It's like one of those recipes that specifies the brand of oat flakes you use. No other brand will work! 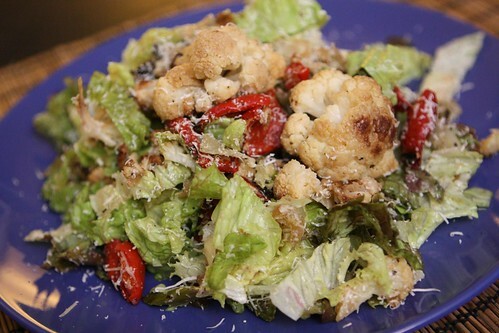 I took last night's roasted cauliflower, pepper, asparagus, and onion and tossed them with some chopped lettuce, grated Parmigiano-Reggiano, lemon juice, olive oil, salt, and pepper for a starter. For the main course cooked down some cauliflower, garlic, and onion in butter and olive oil. 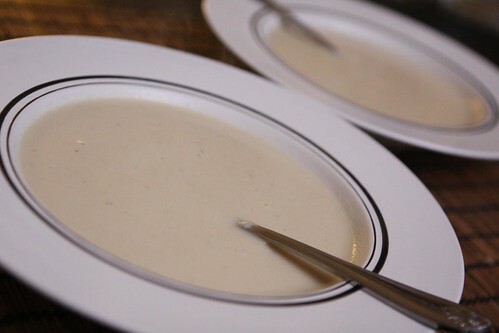 I put in some chicken stock from the freezer, reduced it down, then added a little milk and pureed in the whole thing with my immersion blender. The whole dish could have used a little sprinkling of chives or green onion or something but I was somewhat limited by the contents of our fridge and my newfound love for saving money. 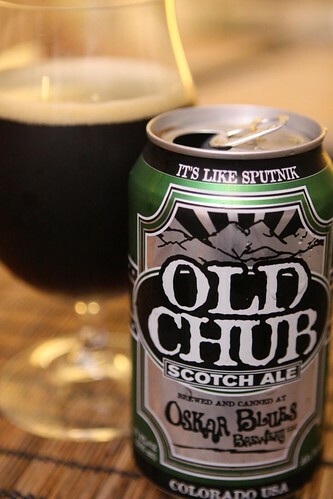 Since I am always hesitant about pairing beer with soup I settled down with this Old Chub Scotch Ale from Oskar Blues after dinner. This was an extremely well-brewed Scotch Ale and I enjoyed it immensely. Pouring beer from a can into a tulip glass still feels strange. With the way craft cans are going I guess I will get used to it in time. 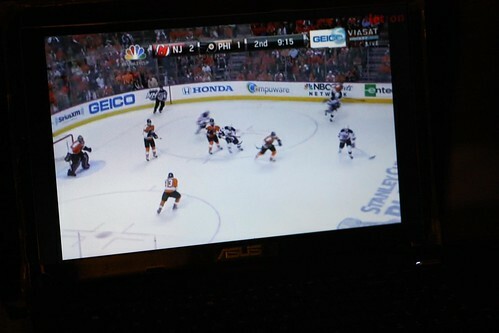 Since the NHL refused to take our offer of $30 a month to be able to watch the playoffs we have resorted to websites that will stream the games. The quality is actually remarkably good and it's $30 less a month than we were prepared to spend! Thanks organized professional sports for being so stupid and short-sighted! It's saved us a ton of money! Go, our favorite sports team, go!